Banging on your brother's head may be fun, but when it comes to drumming, it has its limitations. If you want to practice like a pro, you need a pro practice device. 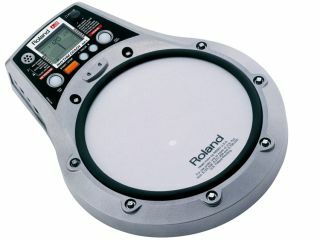 The Roland RMP-5 Rhythm Coach is what we're talkin' about. The RMP-3 made headlines when it was announced in early 2005. Today, Roland builds on its winning rhythm line with the new RMP-5. Sharing a few key features in common with the popular RMP-3, the RMP-5 has a great-feeling, tunable mesh drumhead, and a convenient one-piece molded body with integrated pad and brain. The RMP-5 strides to the front of the class, however, with its 54 onboard PCM sounds (including snare drums, kick, cymbals, and percussion instruments; the RMP-3 has no built-in sampled sounds) plus an external dual trigger input so you can add a kick and cymbal pad for drum kit practice. U.S. list price is $279.00.